Glass is clearly beautiful, transparent and infinitely recyclable. It does not corrode, rust or rot. Glass is made from sand, an abundant resource and is therefore a very sustainable material. And glass can be made to be strong under compressive pressure. Very strong. Researchers from the faculties of Architecture and the Built Environment and Civil Engineering and Geosciences of TU Delft are jointly developing a glass bridge to demonstrate that glass is very suitable for building structures. The researchers design their glass bridge for the entrance of The Green Village, an experimental site to test innovative and sustainable designs at the TU Delft science park. Joris Smits, senior architect and programme manager of the Bridge Project at the testing site, views designing bridges as an act of connecting people and places. He is excited to use glass as new building material. Ate Snijder, PhD researcher Architectural Engineering, and co-initiator, adds that “by creating an archetypical load-bearing structure, people can experience first-hand that glass can carry weight.” Telesilla Bristogianni, PhD researcher Civil Engineering, loves the beauty, strength and invisible functions of cast-glass just as much as Smits and Snijder. She researches the production of prototypes of cast glass bricks, and spends many hours a day working with a hot oven developing the novel building components. The three researchers, along with the Glass and Transparency Research Group of TU Delft, contribute to designing the innovative glass bridge. The idea for this bridge was inspired by the Hollywood characters Loki and Thor dueling on the Bifrost Bridge in the movie Thor (2011). Triggered by this mythological, sparkly and transparent bridge, a friend of Smits started calculating whether building a transparent structure of that type would be possible to build in the real world. He worked out that it could be done if built out of solid diamond. Later when Smits saw the Chanel glass façade in Amsterdam, engineered by his colleagues from TU Delft, he got the idea to use cast glass as an affordable alternative to the strength and clarity of a diamond. Snijder had been equally captivated by the possibilities of glass as a building material. He had been enchanted by Tokujin Yoshioka’s glass chair which seems to ‘disappear’ in the rain. He thought the concept of the movable bridge through, with the aid of parametric models and digital simulations. Enthusiastic about the possibilities, Snijder and Smits initiated their programme to showcasing glass in a way that has never been done before. Unlike in the movie, Thor will not be able to break the bridge with his massive hammer. He may be able to cause a crack in a single cast glass stone, but the bridge will remain intact. A cracked brick can be replaced. Snijder explains that the arch shape generates compressing forces: “Glass and steel are of comparable compressive strength.” Bristogianni adds that “by carefully considering the design-calculations you can construct a glass structure with excellent compression to avoid any kind of tension.” Bristogianni gained a lot of experience on working with glass elements when she, along with her colleague Faidra Oikonomopoulou, were responsible for building up the unique and innovative glass masonry façade of the Chanel store in Amsterdam. They proved that the glass facade in Amsterdam was in many ways stronger than concrete. It could withstand a force to an equivalent of two full-sized SUVs. At the façade, the cast-glass bricks were held together by glue. The bridge designers have thought of a way of implementing the cast-glass bricks without the need of cement or glue. The geometrical shape of the bricks will hold them in place through the compression force generated by the arch shape. The construction method offers an ideal solution for the circular economy, as the bridge can be disassembled and rebuilt on another site. By leaving out any form of adhesives, Smits and Snijder’s new bridge design is only and entirely made out of cast glass bricks. This is important, because the use of glass as building material is a significant step toward minimizing waste of materials. Glass components can be totally melted down and re-molded. While it still takes energy to recycle, it requires far less energy than other commonly used structural materials. For example, while steel is three times denser than glass, it recycles at a much higher temperature, requiring a 10:1 ratio use of energy. Compared to steel, glass recycling is very efficient, when taking circular economy into account. 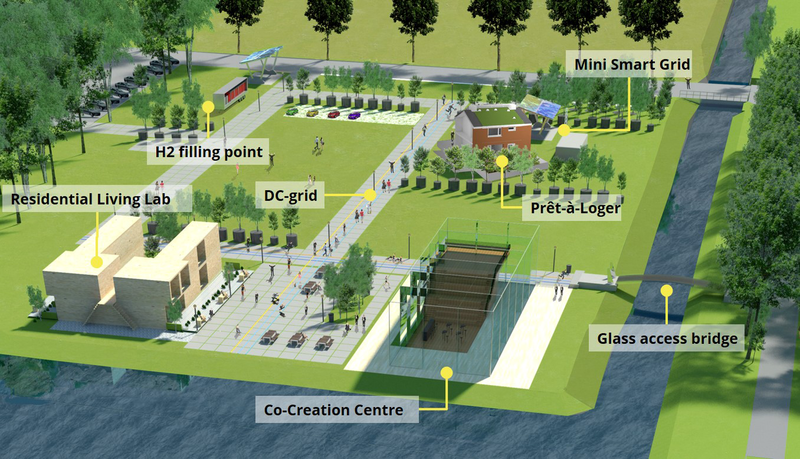 The Green Village provides researchers and businesses the opportunity to build, test and demonstrate a prototype of their innovations at a living lab location with end users present. In this living lab setting of The Green Village the aim is to accelerate the development and implementation of radical innovations. The technologies being tested are usually in an early stage of development, the business model is perhaps not yet fully ready, and the application may not yet meet all current regulations. The end users are the frequent visitors and the experimental real-life setting will be open to everyone. From 2017 onwards, the end users will include people working, studying and living on site in The Green Village. Through the commitment of scientists, businesses, government and end users, the stakeholders jointly experience the early application of sustainable solutions. 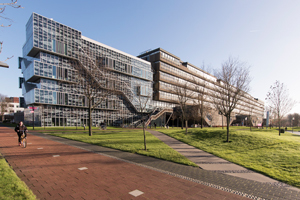 Staff of the living lab filed for the necessary building permits at the municipality of Delft, and prepared the basis for the infrastructure for building the glass bridge. Architect Jos Smits explains that “by building abutments in concrete on the shore, The Green Village provides the foundations (literally) for us to experiment with innovative sustainable bridge designs.” The building activities for these two bridge platforms were completed in August 2016. The Green Village has made arrangements with other stakeholders to insure that the bridge can be used safely by the people living, working and visiting the living lab. Through this, the researchers can gather feedback from visitors of the Green Village on how they experience crossing a glass bridge. 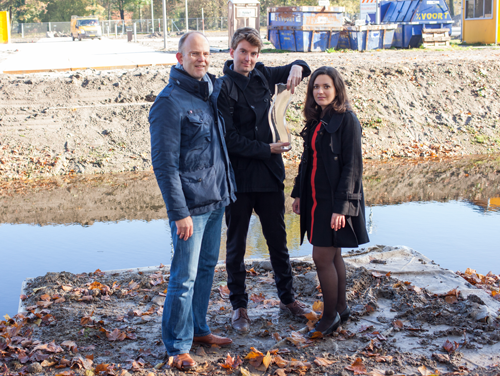 Facility Management of TU Delft will take care of the maintenance of the bridge. As soon as all the societal and technical issues are completed in the live setting of the Green Village with end users present, the glass bridge will be ready for implementation elsewhere. When that moment comes, the researchers will continue to use the abutments for a new series of bridges that the Bridge Project will test at the experimental lab. The Green Village is an initiative of TU Delft and Stichting Green Village. The platform is supported by the European Regional Development Fund, the Province of South-Holland, the municipality of Delft, Alliander, Gasterra, and many others. 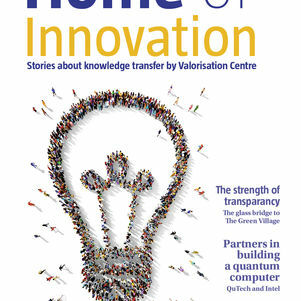 This article was first published in Home of Innovation – a magazine created by TU Delft’s Valorisation centre. The publication features a series of interviews with TU Delft researchers and entrepreneurs and their innovative projects or ideas.